Please Login or Register for a Lafayette Instrument Online Account to continue. The Model 35580*C is the same as Model 35580 except that it supports 220VAC 50/60Hz AC input. 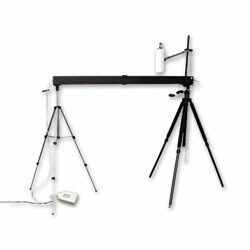 When mounted on a series of tripods and connected to a photocell, the Bassin Anticipation Timer Model 35575 is modified for a more complex task. The goal is to time the approach of the light with the swing of a bat so that the infrared beam is broken at the same time that the light reaches the end of the runway. This unit could be applicable for a bat swing, tennis swing, or even a soccer kick. The control box displays in milliseconds, the amount of time that the swing or kick was too early or too late.